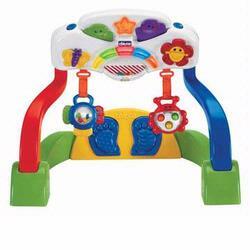 Chicco's Duo Playgym is an electronic toy that will keep your baby busy. The Duo Playgym will stimulate your baby's musical and audio skills with its melodies and sound effects while also stimulating your baby's visual skills with features like the revolving sphere and the light effects. The Duo Playgym targets babies’ motor skills with the swinging detachable toys, the revolving sphere, and other manual activities. It even has activities to stimulate your baby's feet movement. The Duo Playgym easily modifies from a lying-on-the-tummy position to a lying-on-the-back position. You can even attach the playgym to your baby's crib.